Any of your trusted contacts can ask for your location and you can deny it if you don’t want to share or if you are safe. If you will not reply within a specified time frame, then the location will be automatically provided. Best of all, the app even works if your phone is dead or it doesn’t have an internet connection. Your last known location will be given to your trusted contacts in that case. Integrates well with Google Maps’ share your location feature. Doesn’t have a quick panic button to immediately alert your contacts that you are in trouble. Download Trusted Contacts for Android or iOS. The manual is completely free and can be used offline. Some of the popular survival topics it covers include, food, psychology, medicine, shelter, fire, use of plants, animals, cold weather, weapons, directions and many more. The app is only available for Android, but iOS users can try Survival Guide which is just as comprehensive. Comprehensive knowledge on a variety of disaster situations. Doesn’t directly focus on natural disasters and difficult situations created by them. It’s all about surviving with minimal resources in any situation. 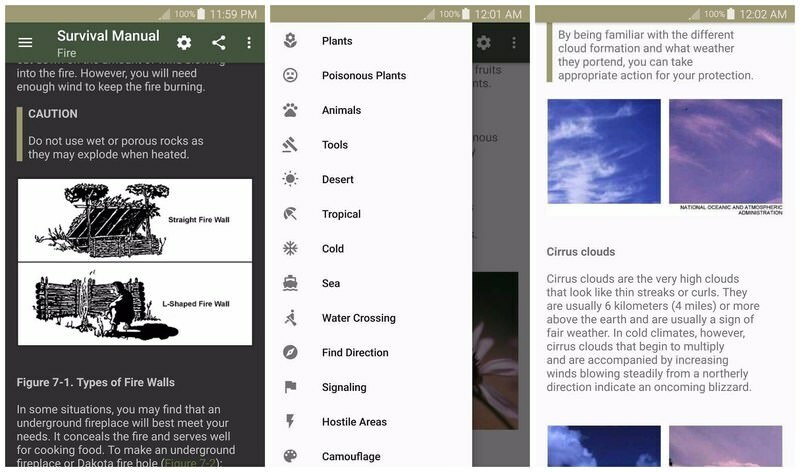 Download Offline Survival Manual for Android. The best safety against natural disasters is to keep a tab on disaster activity beforehand. You’ll have more time to react if you know a natural disaster is on its way to your location. Disaster Alert keeps you updated with multiple types of disasters happening all over the world in real-time. List of disaster tracking includes earthquakes, hurricanes, flood, storm, tsunami, and volcano etc. Wildfire is also on its way and will be supported soon. You can get notification of natural disasters near your area, view disasters on an interactive map, and learn more about an active hazard. Notification of disasters near your area. Lacks community interaction, all the updates are taken from official sources. Download Disaster Alert for Android or iOS. Some of the topics it covers include disaster prevention, disaster relief, disaster recovery, disaster prevention organizations, donations, aftershocks, immediate safety, types of disasters, and structural damage. Covers all aspects of disaster management. The explanations provided are quite basic. 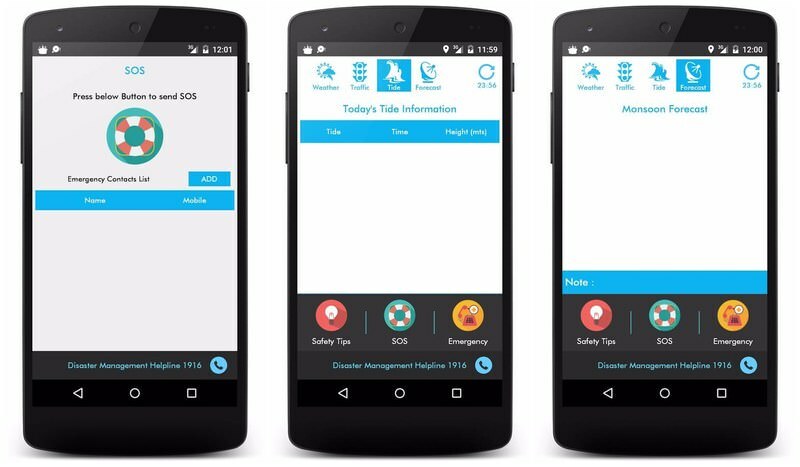 Download Disaster Management for Android. 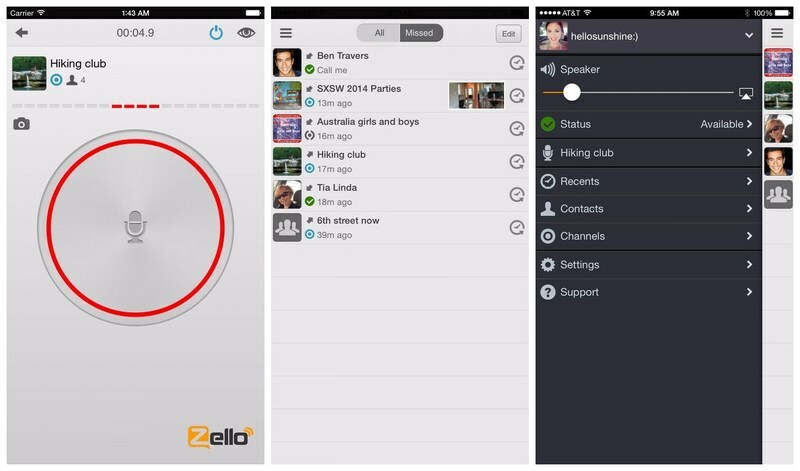 Zello does require an internet connection, but it can easily work on a slower internet connection – even 2G network. You can also check status and availability of your friends and track voice history. Best of all, it’s completely free for personal use. Can talk to up to 2500 contacts. It’s useless without an internet connection. Directly plays newly received audio messages in a conversation without notifying or offering control. Download Zello PTT Walkie Talkie for Android or iOS. Earthquake Alert! uses official sources and community power to send real-time alerts of earthquakes near your area. Many times, it’s quick enough to alert you 10-20 seconds before the earthquake hits you. And those few seconds are usually enough to run towards a safe place. 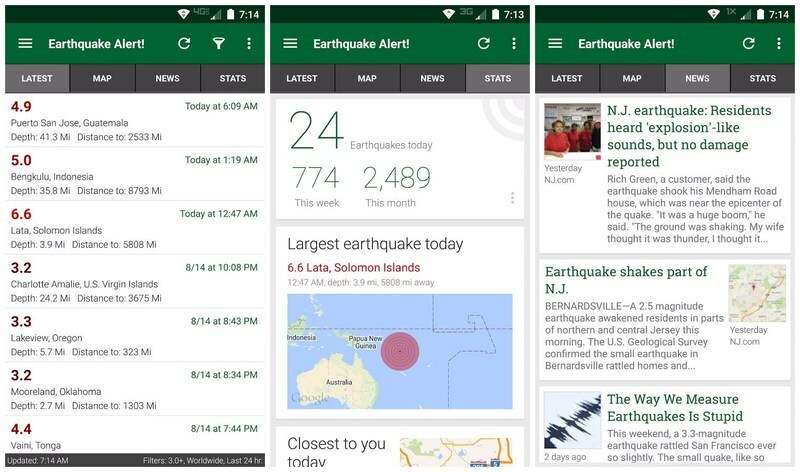 You can also track earthquakes all over the world and create custom notifications for specific areas (where your loved ones may reside). Won’t always alert you before the earthquake hits, and it sometimes gets delayed as well (up to 5-8 minutes). Download Earthquake Alert for Android. Of course, not all of their predictions come true, but many are quite accurate and good enough to help you take safety measures beforehand. It’s a paid app costing $2.99, but for an app that is being powered by knowledge of actual humans, it isn’t much. Provides prediction of a disaster before it strikes. 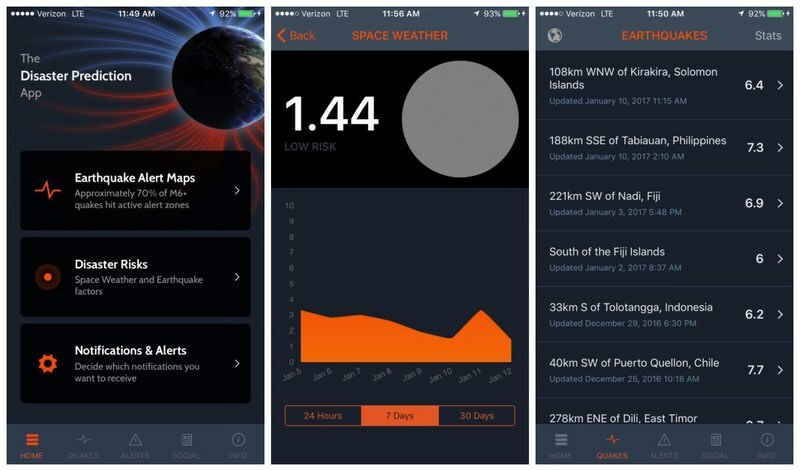 Easy to use interface with dedicated tabs for earthquake and solar activity. Earthquake predictions are mostly vague and some parts of the world aren’t covered. Download Disaster Prediction for Android or iOS. 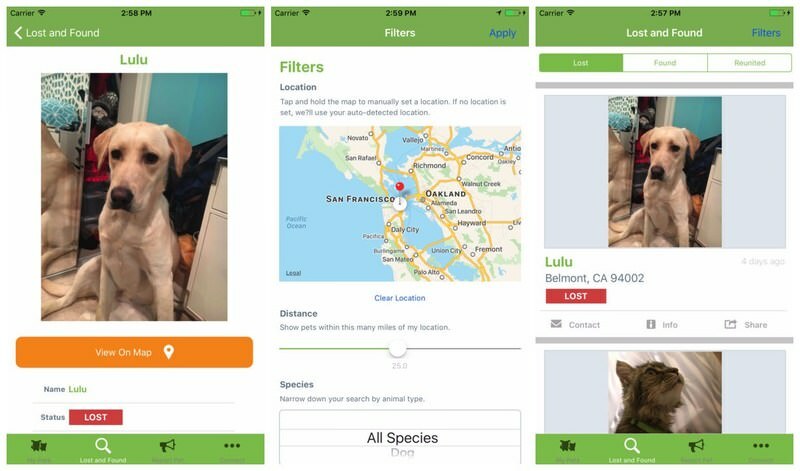 If someone has lost their pet, they can provide images and details of the pet and the all the users of PawBoost will be notified. Once found, a user can report back with the picture of the pet found. Makes Both posting and pet recovery process smooth. Completely free to use without any ads. The user base is still quite low, so the chance of PawBoost user meeting your pet is low. Download PawBoost for Android or iOS. Whenever you are in trouble, Bull Horns Panic Button offers reliable features to send the help to your location. The app has a big panic button that will alert your contacts that you are in trouble along with your current location. You can add a list of people you trust and official security departments that will come to your rescue when in trouble. You can also notify app community in hope of some help or help someone in need. If you have already signed up with a security company, then Bull Horns Panic Button developers can also directly work with them to offer real-time tracking of your location. Just set up the app right, and when a natural disaster hits a simple tap is all you need to get help. Multiple ways to get help. Has built-in emergency numbers of over 150 countries. You can communicate over both WiFi and SMS. Could have integrated a loud alarm to alert nearby people. Download Bull Horns Panic Button for Android for iOS. Probably the best app to keep your family safe and connected. Life360 helps you create groups of people you care about, like your family or friends. You can easily track the location of people in the groups and even communicate with them right from the app through a custom map that will help you track your family in real-time. The app also keeps completely history of all the people in the group. Even if you lose connection to someone, you can still track their last available location. Best of all, the tracking and communication features are completely free. Offers all the features you need to keep the family connected. Most required features are available for free. Offers the best tracking when connected to WiFi (confirmed by developers), the mobile data connection may show inaccurate information. 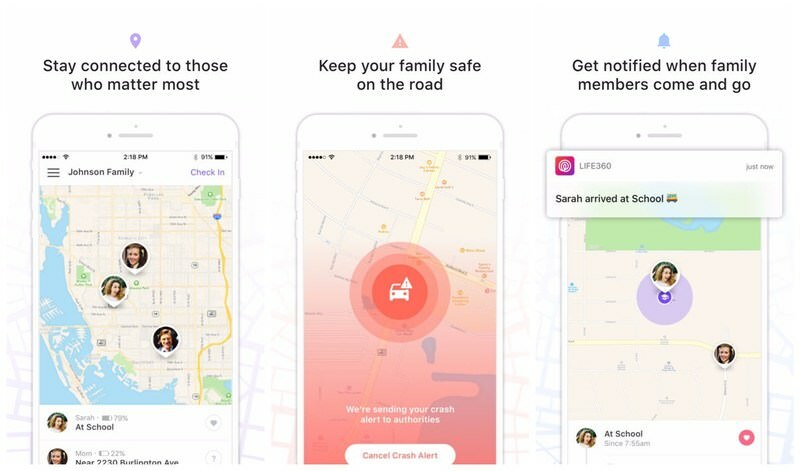 Download Life360 Family Locator for Android or iOS. In a natural disaster, you may have to travel to safety and a good offline GPS maps app will be your best friend when the internet quits on you. Although there are many, but I recommend HERE WeGo for Android and iOS as it allows you to download the map of a whole country along with complete navigational. 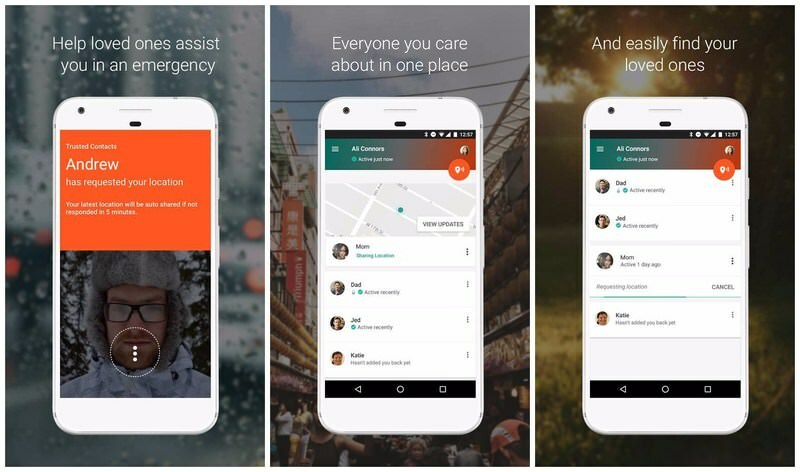 These apps should help you before, during and after a natural disaster strikes. Being updated with natural disasters and keeping communication with your family and friends are key factors to minimize the effects of a natural disaster. I only use four of these apps and they give me enough peace of mind. 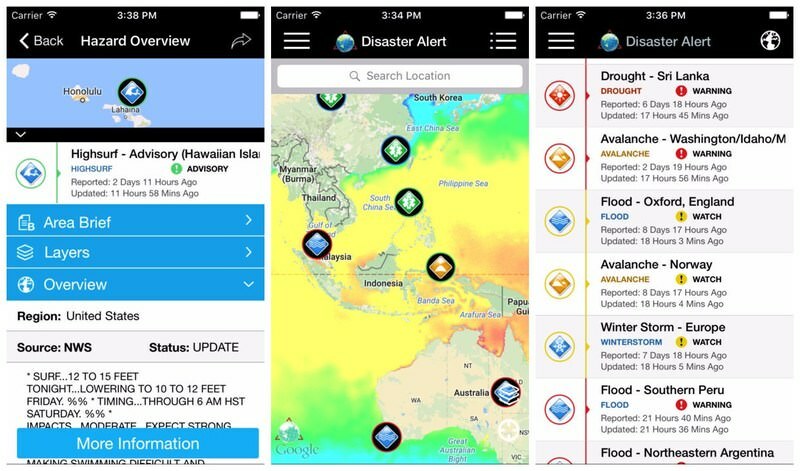 Which one of these apps you are going to use to prepare for natural disasters?